Constructivism was an artistic and architectural philosophy that originated in Russia beginning in 1913 by Vladimir Tatlin. This was a rejection of the idea of autonomous art. He wanted 'to construct' art. The movement was in favour of art as a practice for social purposes. Constructivism had a great effect on modern art movements of the 20th century, influencing major trends such as the Bauhaus and De Stijl movements. Its influence was widespread, with major effects upon architecture, sculpture, graphic design, industrial design, theatre, film, dance, fashion and, to some extent, music. 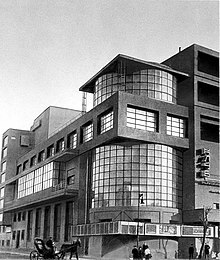 Constructivism as theory and practice was derived largely from a series of debates at the Institute of Artistic Culture (INKhUK) in Moscow, from 1920 to 1922. After deposing its first chairman, Wassily Kandinsky, for his 'mysticism', The First Working Group of Constructivists (including Liubov Popova, Alexander Vesnin, Rodchenko, Varvara Stepanova, and the theorists Aleksei Gan, Boris Arvatov and Osip Brik) would develop a definition of Constructivism as the combination of faktura: the particular material properties of an object, and tektonika, its spatial presence. Initially the Constructivists worked on three-dimensional constructions as a means of participating in industry: the OBMOKhU (Society of Young Artists) exhibition showed these three dimensional compositions, by Rodchenko, Stepanova, Karl Ioganson and the Stenberg brothers. Later the definition would be extended to designs for two-dimensional works such as books or posters, with montage and factography becoming important concepts. Tatlin's tower started a period of exchange of ideas between Moscow and Berlin, something reinforced by El Lissitzky and Ilya Ehrenburg's Soviet-German magazine Veshch-Gegenstand-Objet which spread the idea of 'Construction art', as did the Constructivist exhibits at the 1922 Russische Ausstellung in Berlin, organised by Lissitzky. A Constructivist International was formed, which met with Dadaists and De Stijl artists in Germany in 1922. Participants in this short-lived international included Lissitzky, Hans Richter, and László Moholy-Nagy. However the idea of 'art' was becoming anathema to the Russian Constructivists: the INKhUK debates of 1920–22 had culminated in the theory of Productivism propounded by Osip Brik and others, which demanded direct participation in industry and the end of easel painting. Tatlin was one of the first to attempt to transfer his talents to industrial production, with his designs for an economical stove, for workers' overalls and for furniture. The Utopian element in Constructivism was maintained by his 'letatlin', a flying machine which he worked on until the 1930s. The Productivist theorists Osip Brik and Sergei Tretyakov also wrote screenplays and intertitles, for films such as Vsevolod Pudovkin's Storm over Asia (1928) or Victor Turin's Turksib (1929). The filmmakers and LEF contributors Dziga Vertov and Sergei Eisenstein as well as the documentarist Esfir Shub also regarded their fast-cut, montage style of filmmaking as Constructivist. The early Eccentrist movies of Grigori Kozintsev and Leonid Trauberg (The New Babylon, Alone) had similarly avant-garde intentions, as well as a fixation on jazz-age America which was characteristic of the philosophy, with its praise of slapstick-comedy actors like Charlie Chaplin and Buster Keaton, as well as of Fordist mass production. 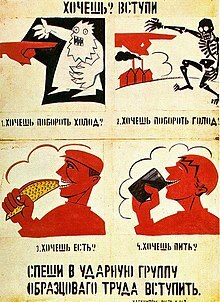 Like the photomontages and designs of Constructivism, early Soviet cinema concentrated on creating an agitating effect by montage and 'making strange'. In Cologne in the late 1920s Figurative Constructivism emerged from the Cologne Progressives, a group which had links with Russian Constructivists, particularly Lissitzky, since the early twenties. Through their collaboration with Otto Neurath and the Gesellschafts- und Wirtschaftsmuseum such artists as Gerd Antz, Augustin Tschinkel and Peter Alma they affected the development of the Vienna Method. This link was most clearly shown in A bis Z a journal published by Franz Seiwert the principal theorist of the group. They were active in Russia working with IZOSTAT and Tschinkel worked with Ladislav Sutnar before he emigrated to the US. ^ Catherine Cooke, Russian Avant-Garde: Theories of Art, Architecture and the City, Academy Editions, 1995, page 106. ^ Oliver Stallybrass, and Alan Bullock (et al.) (1988). The Fontana Dictionary of Modern Thought (Paperback). Fontana press. p. 918 pages. ISBN 0-00-686129-6.